One of the gun areas. Wn. Tu301 La Dilanne M.K.B. 'Kermoisan'. 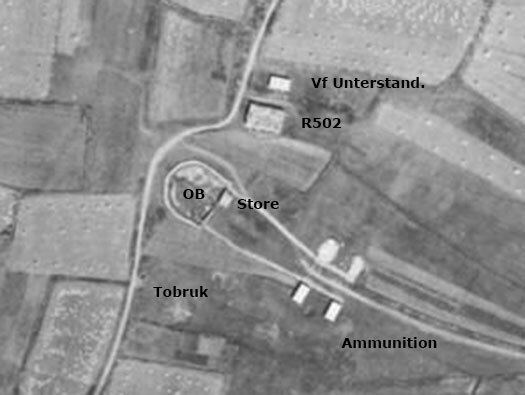 Air photo of the FCP with a defence of Flak guns around the south side. They may have been the 7.5cm Flak M33(f). Now leaving the guns and concentrating on the Fire Control Post. This was built for the battery and would also have taken on the four 30.5cm guns when they would have been commissioned. Loading equipment into a new bunker. The steps to the entrance in the rear and the three observation levels looking out over the Loire estuary and covering the entry into the St Nazaire U-boat pens. Well my Grandson wanted to see a bunker so I found him this one on our summer holiday. Even my wife came along and thats a rare event. 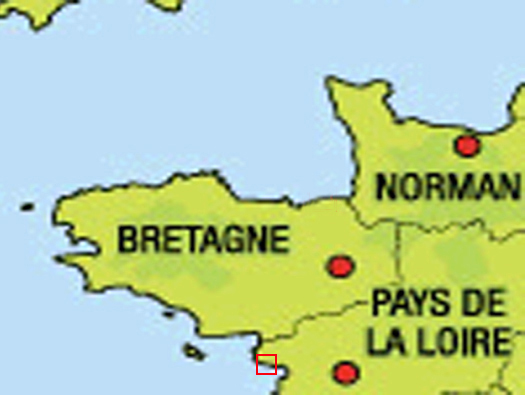 This photo comes from DEFE 44-98 JIB Report on coastal batteries in France. Mg34 covering the back door through the close combat window..
Close combat room and stairs to lower level. The stairs down to the lower level which has no windows. I am not sure if its original but we often find the niches by the doors but never see what was in them..
A special mounting for the Mg34. This room is what may be called a guard room, any body entering and leaving may have signed in and out, also a spare cupboard for all sorts of things. The second close combat room covering the entrance room. Why a French soldier and a Label machine gun should be defending the other CCD room. It could be a Fusil-Mitrailleur (FM) Model 1924-M29 with a side mounting magazine. Model of the S414 showing how it would have looked as it was being built. Later it was camouflaged with windows painted on and a false roof fitted. Look below. Oversized windows gave the impression that the bunker was smaller and was a house. It would be interesting to know if the camouflage worked? Going up to the third and fourth level. Thomas taking to bunker hunting with a passion and climbing up this ladder as if he had done it many times before. This is a German stabilized torpedo guidance optics and would not have been used here, but an example of what may have been used here. .
A lovely piece of equipment, needs cleaning but you can view through the lenses. One sailor would stand with the straps under his armpits and look through the eye pieces. Then another sailor would stand at 90degrees to the first and look through a matched pair of eye pieces and by adjusting knurled adjusters the enemy could be targeted. Now our new bunker hunter advances to the upper layer. The steps up to the fourth layer. Looking into the range finder room of an M162a but is very much like the one in an S414. Held up with heavy steel jacks which tend to rust out, this one has some smaller extra ones added. 360degree observation room, cold and windy with no windows. This could be the base of an original range finder. One of the legs that holds the roof up. The view towards St Nazaire. The view towards the gun battery area. The water tower above the S741 emplacement. Water tower above the emplacement. Now going up to the smaller forward observation room. He is off again leading the way. A Field Gendarme answering the phone. The Italians had a submarine unit in Bordeaux and may have had a liaison officer here. A copy of a wall painting that was painted on a hotel wall in the area. Gas mask tin holders and M45 tin helmets. This model shows the way the camouflage was painted on and an added roof. Two hand operated filter sets, a handle not unlike a cars starting handle attached and turned at a steady speed, air is sucked in from outside and filtered of gases (if used) or smoke. and the bunker will be over pressured so any leakage, gas could not enter the sealed areas of the bunker. Mg42 on a tripod, several rifles, 60mm mortar and some 60mm Panzerfausts. An eastern soldier one of many who were volunteer /conscripted into the German army in his distinctive uniform. To give authenticity there is a water tank high up on the wall, below a central heating unit, a generator 2cylender, a soldier pumping fuel in from an outside tank for the generator. Thomas showing us a painting removed from a room in La Baule or St Nazaire. Some form of beach defence, possibly a concrete case for an old shell that would have had a simple mechanism when activated the shell would explode. 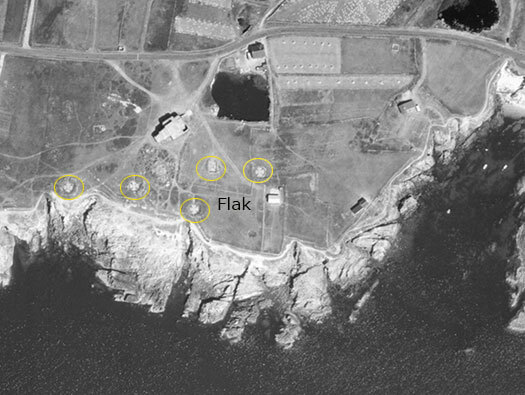 One of the Flak Turms. The view towards St Nazaire U-boat pens.